Introduction: The aims of this study were to (1) investigate the root and root canal morphology of human third molars in a Jordanian subpopulation and (2) determine the effect of age, gender, and tooth location on the morphology of these teeth. Materials and Methods: A total of 159 maxillary and mandibular third molars were used in this study. After canal staining and tooth clearing, the specimens were examined, and the following morphological features were recorded: Number of roots and presence of roots fusion, number of canals and their configurations in each root, total number of canals per tooth, and incidence of lateral canals and intercanal communications. Results: The majority (74.2%) of maxillary molars had 3 roots and 3 (55.1%) or 4 (27%) canals while the majority (74.3%) of mandibular molars had 2 roots and 2 (38.6%) or 3 (45.7%) canals. Roots fusion was found in 70.1% of maxillary molars and 40.7% of mandibular molars. Type I canal configuration was the predominant type in distal roots of mandibular molars and distobuccal and palatal roots of maxillary molars. 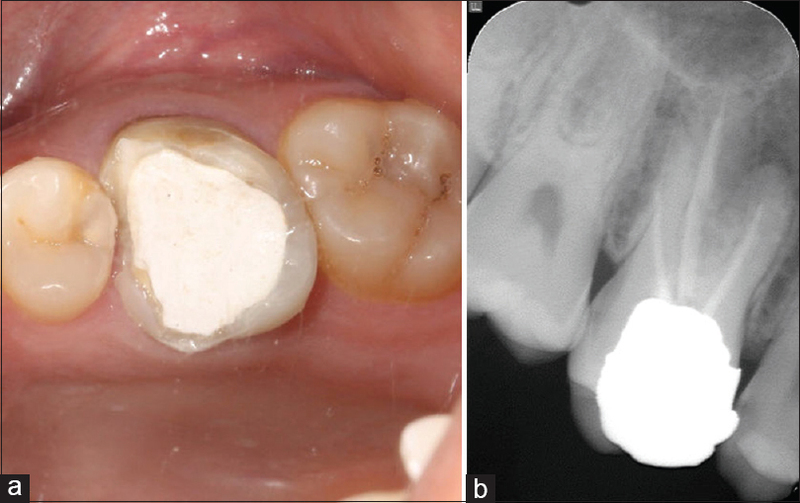 Multiple canals were evident in 36% of the maxillary mesiobuccal roots and 56% of mandibular mesial roots. Single/fused roots showed a wide range of canals number and configurations. The number of roots and canals in both molars did not differ with gender, age, and tooth location. Females had a higher incidence of roots fusion than males and this difference was significant in mandibular molars (P = 0.034). Conclusions: Third molars showed a range of root and canal morphologies. Careful preoperative assessment is essential before commencing root canal treatment on these teeth. Aim: The amount of apically extruded debris caused by new nickel-titanium rotary systems after determination of the working length (WL) with an apex locator has not been investigated. To compare the amount of apically extruded debris with ProTaper Next (PTN) and HyFlex CM systems after determination of WL with/without an apex locator. Materials and Methods: Forty-eight extracted mandibular incisor teeth divided into four groups were used in this study. In Groups 1 and 2, a 10 K-file was progressed until it was just visible at the major apical foramen and WL was recorded as 1 mm short. In Groups 3 and 4, the WL was determined with the Root ZX (sensitivity of 0.1) using a 10 K-file. During the instrumentation, the PTN was used to X2 in groups 1 and 3, and the HyFlex CM was used to 25/.06 in groups 2 and 4. Distilled water was used as an irrigant. Debris was collected in tubes then stored in an incubator at 68°C for 5 days to evaporate the distilled water. The Eppendorf tubes, including the extruded debris, were weighed to obtain final weights. The amount of extruded debris was calculated by subtracting the weight of the empty tube from the weight of the dry tube. Data were analyzed by Kruskal–Wallis and Mann–Whitney U-test. Results: Less apically extruded debris was obtained in Group 3, with a significant difference compared to Group 1 and Group 2 (P < 0.05). Conclusions: The usage of apex locator to determine the WL decreased the amount of apically extruded debris. In addition, PTN caused less apical debris extrusion after determination WL with/without apex locator. Aim: (1) To evaluate knowledge, attitude, and practices about methods of gutta-percha disinfection by endodontic postgraduate students in India. (2) To check the sterility of two commercially available, freshly, and previously opened gutta-percha box which was exposed to the clinical environment. Materials and Methods: Data were collected in a prescribed format from 400 endodontic postgraduate students. The questionnaire was designed to evaluate their knowledge about standard sterilization protocols of gutta-percha points, attitude toward the utility of guidelines/protocols of sterilization in the success of root canal treatment and practice of these sterilization protocols. For microbial assay, 10 cones of freshly opened gutta-percha 6% taper of size 25 from diadent (Diadent Group International, Korea) Group A and Dentsply (Dentsply Maillefer, Switzerland) Group B. Cones from the same companies which was kept in chair side working environment during obturation were selected as Group C and Group D, respectively, for aerobic and anaerobic culturing. 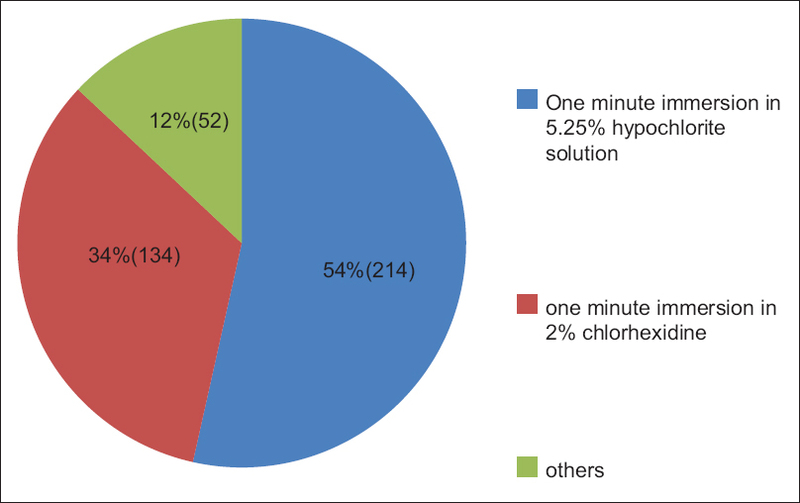 Results: Among the respondents 75% did not practice any disinfection protocols. Only 25% followed the disinfection of gutta-percha cones. In anaerobic culture Group B turned out to be positive in all samples, all other groups were negative. Conclusions: The endodontic postgraduate students possess adequate knowledge on disinfecting gutta-percha cones, but regular practice of this is uncommon. Microbial assay showed that even freshly opened gutta-percha cones might be contaminated. Aims: The aim of this study was to investigate the degree of tug-back after canal preparation with respect to the Gutta-percha-occupied area (GPOA). Materials and Methods: Roots of twenty premolar teeth were prepared till size 35/0.04, then GP cones of same size and taper were adapted to root canals and the degree of tug-back sensation was scored as loose, slight, adequate, and strong. Root canals were filled with GP and AH26 sealer, and then sectioned horizontally 1 mm from the apical end at three levels. 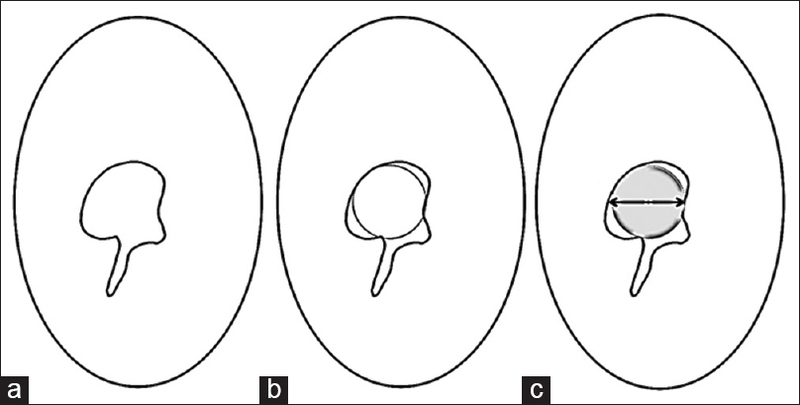 GPOA and its sum from the three levels sum of GPOA (sGPOA%) were calculated using digital stereomicroscope. Statistical Analysis: At each sectioned level, GPOA% was compared with the score of tug-back sensation using one-way ANOVA at a 5% significance level. Multiple pairwise comparisons were performed using Tukey test. Results: Tug-back sensation was present in all canals, described as slight, adequate, and strong in 4, 8, and 8 canals, respectively. Among the tug-back scores, quantitative analyses of GPOA% showed significant differences at 2- and 3-mm levels. The strong tug-back with sGPOA of 76.5 ± 11.1% was significantly higher than that of slight tug-back. Conclusions: Under the conditions of this study, the tug-back scoring system can be applied to determine the amount of GP adaptation inside the root canal. Strong tug-back sensation showed the highest GP adaptation although at least one-fifth of the apical canal region was left unfilled. The maxillary first molar exhibits unpredictable root canal morphology. Different number of root canals has been reported with the aids of new tools. It is very important to clinically detect all canals for better outcome results. 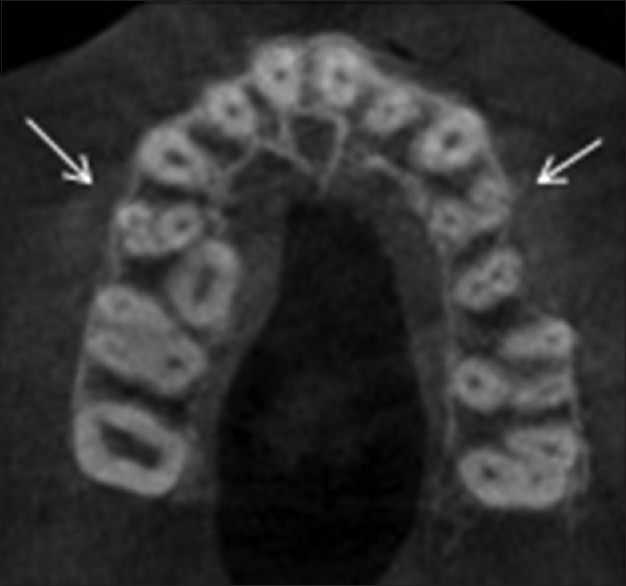 The purpose of the present case is to present a case of the maxillary first molar in a Saudi male patient with an anatomical variation of having six root canals that were confirmed with cone-beam computed tomography. Children have a common habit of exploring carious or traumatically exposed teeth using various foreign objects such as metal screws, staple pins, darning needles, pencil leads, beads, paper clip, and toothpicks, which may sometimes break inside the pulp chamber or root canal. Majority of such cases are asymptomatic and hence diagnosed accidentally on routine radiographic examination. However, embedded foreign objects may sometimes act as a potential source of infection and are convoyed with pain or recurrent swelling. Dentists must be aware of the self-inflicted dental injury, its consequences, and selection of the all-inclusive treatment strategies giving due consideration to cost-benefit ratio of the different treatment options. This case series highlights the possible dental consequences of placing foreign objects in the mouth and various management strategies. 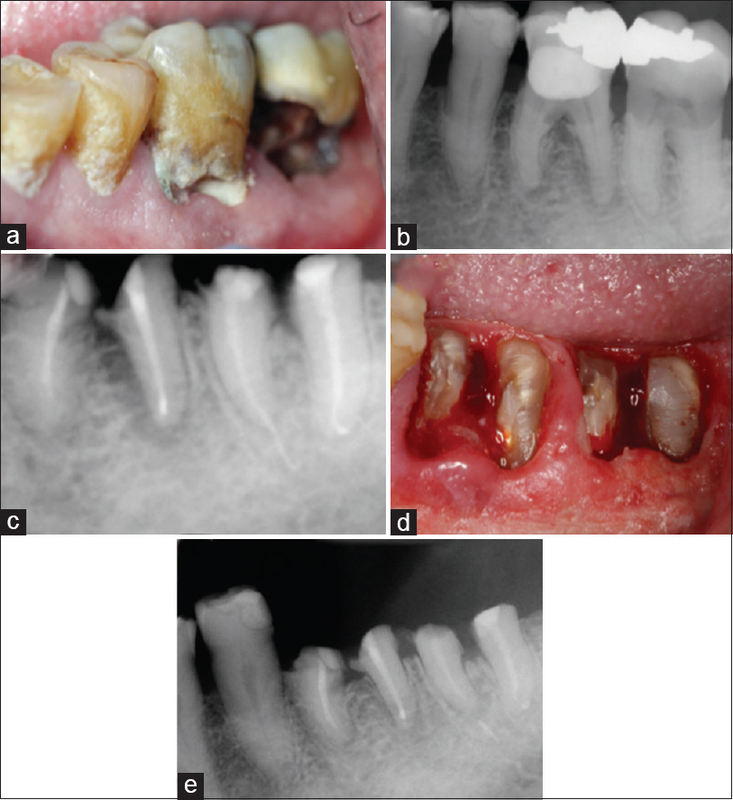 Four cases of self-inflicted dental injuries involving patients aged 10–20 years are presented and investigated from the endodontic, pedodontic, and psychiatric viewpoints. In all cases, the cause has been easily identified by clinical appearance corroborated with a good history. 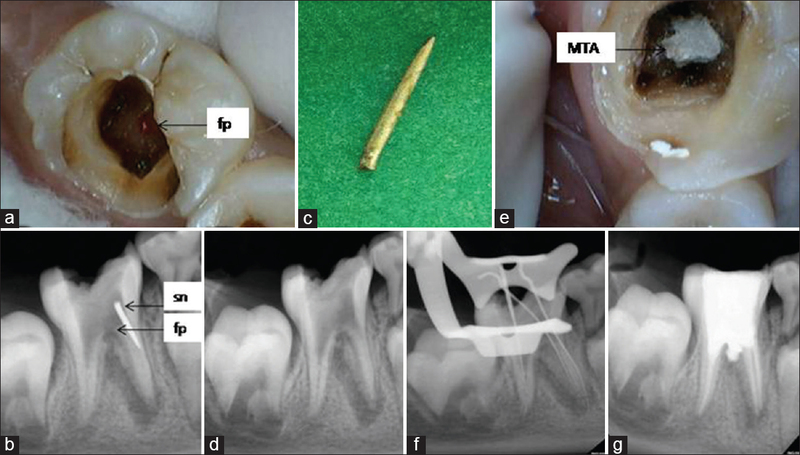 This paper discusses a nonsurgical technique to retrieve these objects from the root canal with minimal damage to internal tooth structure. A deep knowledge of the internal and external anatomy of various human teeth is a backbone for a successful outcome of endodontic therapy. Usually, maxillary first premolar tooth has two roots, buccal and palatal. Three-rooted maxillary first premolar is scarce. The clinician has to expect any variation in root canal system and use the best diagnostic tools to manage the cases. The aim of this case report was to illustrate bilateral three-rooted maxillary first premolars and to describe the endodontic implication in preoperative assessment and during operative procedures.